Two National Press Foundation journalism awards – for reporting on mental health issues and for reporting on energy/environmental issues – are now open for entries. 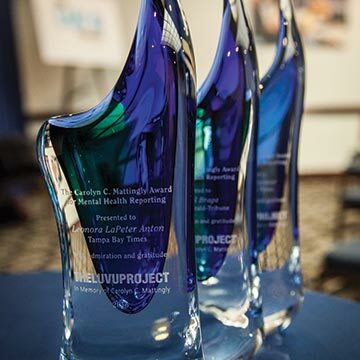 The Carolyn C. Mattingly Award for Mental Health Reporting recognizes exemplary journalism that illuminates and advances the understanding of mental health issues and treatments for the illness. The award, which carries a $10,000 prize, was established in memory of the Potomac, Maryland, philanthropist and activist. Mattingly’s family decided to establish the award in the aftermath of her tragic death in 2014. You can view last year’s winning entry and apply here. The Thomas L. Stokes Award for Best Energy Writing was established in the spring of 1959 by friends and admirers of the late Thomas L. Stokes, a syndicated Washington columnist on national affairs. It is given annually for the best writing “in the independent spirit of Tom Stokes” on subjects of interest to him, including energy, natural resources and the environment. The winner of the award receives $2,000. Learn about previous winners and apply here. The Mattingly and Stokes awards are open to any journalist at a U.S.-based news organization, including print, broadcast and online journalists. Deadline to apply is March 10.